Myelodysplastic syndromes (MDS) are a heterogeneous array of blood cell disorders, hallmarked by anemia, thrombocytopenia, neutropenia, and/or pancytopenia. Expression of immediate early responsive gene X-1 (IEX-1) is diminished in CD34+ stem cells in a large proportion of early stage/low risk MDS patients and severely diminished IEX-1 expression is correlated with a shorter survival time of the patients. Our study showed that lack of IEX-1 predisposed to thrombocytopenia, anemia, and dysplastic bone marrow morphology, typical characteristics of MDS following a non-myeloablative dose of radiation. IEX-1 deficiency adversely affects the function of mitochondria that in turn leads to aberrant differentiation of platelets and red blood cells. We are looking into the mechanisms whereby inadequate function of mitochondria impairs the final stage of reticulocyte maturation and proplatelet formation. 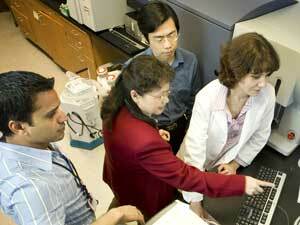 The study could offer new targets or prevention or treatment of MDS. We found that Low-Level Light (LLL) at specific settings could facilitate the differentiation of HSCs both in vivo and in vitro. This beneficial effect on the quality and quantity of HSCs offers great potentials for using LLL as a supplemental modality to improve the production of various blood cells in patients following a variety of stress such as irradiation, chemotherapy, traumatic injury or transplantation. Molecular cascades in association with skin and mucosal innate immunity are investigated with various gene-knockout mice in combination with contemporary intravital imaging, molecular, and signaling technologies. We are particularly interested in the signaling pathways leading to new adjuvants for influenza vaccines, nicotine vaccines, and the like. Antibodies-coated microneedle array patches are fabricated for capturing blood biomarkers via the skin. The results can be potentially read by a mobile phone, making this specimen-free, minimally invasive bioassay a great potential for a variety of applications in the clinics.